A historic Sri Lankan industry spanning 100 year period and producing an essential item in the day-to-day lives of households, is bracing for the sudden dousing of their fires due to supply side pressure. A high level policy directive is now awaited after the intervention of the Industry Minister. “The Sri Lankan safety match industry is an important part of our Small and Medium Industry (SMI) sector" said the Minister of Industry and Commerce Rishad Bathiudeen on 8 May in Colombo. 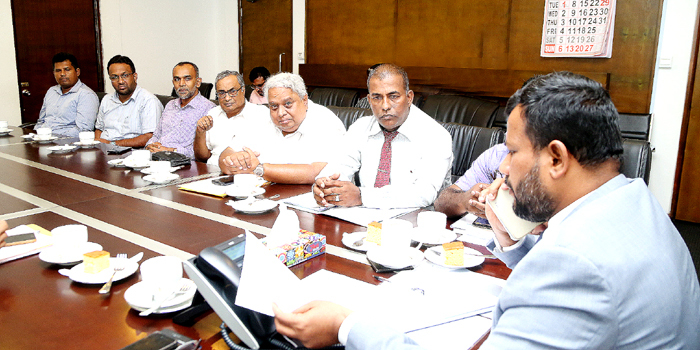 Minister Bathiudeen was addressing the historic safety-match producing industry representatives of Sri Lanka who met him on 8 May at the Ministry, Colombo 3 to inform him of a grave scenario. The industry team was led by Chairman of Sri Lanka Safety Match Makers Association (SLSMMA-and Chairman of Sun Match Co Ltd), Mr B.D.R. Rajan. Mr Rajan explained the grave situation their manufacturing is faced with: "Our entire annual production of more than 12 billion safety matches is sold-out in local market with no exports due to their essential nature in day-to-day lives. However the production will stop at the end of this month and no alternatives in the market. The problem is due to delay in receiving vital chemical imports-potassium chloride and red phosphorus- for our safety match production. These two chemicals are essential and being imported to Sri Lanka under a tender system. We are producers and cannot directly import the chemicals since the manufacturers are not allowed to import directly. We as manufacturers cannot afford to import large quantities of these chemicals and store them too. Therefore two bidders/importers in Sri Lanka have been importing them from India and China and delivering to us. In recent times these essential chemicals are not imported and distributed to us on time. Certain delays in the tender system and the new testing requirement where the chemical samples have to be tested by Industrial Technology Institute of Sri Lanka, instead of the previous, internationally acclaimed SGS (Geneva), has resulted in total stoppage of regular chemical supplies to us. The foreign exporter sending the chemicals to Sri Lankan importer, obtains the SGS certification by themselves and there has been no issues here. However, the sole importers in Sri Lanka have been refraining from importing due to withdrawal of permission, and therefore imports of these essential chemicals have stopped. There is a shortage of these chemicals now and we are unable run the factories, compelled to close down and cannot supply the safety-match requirements of the country anymore. At the centre of the ban is the change of chemical testing from SGS to ITI. The ITI testing is not practical for our manufacturers since it is prohibitively strict unlike SGS. As a result all the 11 Lankan safety-match making companies are at a stage where they cannot run production anymore -and by the end of this month we are compelled to shut down. The closures will result in loss of direct and indirect employment for 8000 persons. The investment by 11 companies in this industry is more than Rs 1100 Million (US $ 7 Million) in assets and machinery infrastructure-this is apart from regular production costs. Safety match is a basic household item and will not be produced locally anymore unless the situation changes. We call upon the Industry Minister Bathiudeen to intervene and relax the new chemical regulations and red tape so that our production can re-start without delay." It is not exactly clear when the history of Sri Lankan safety match industry began but there are records showing 'Made in Ceylon' match boxes to have been produced as early as 1900. Later it was recorded: "... in 1936, proposals were made in the State Council to set up a licensing and quota system to protect the safety match industry, which was one of Sri Lanka's earliest private-sector industrial enterprises."